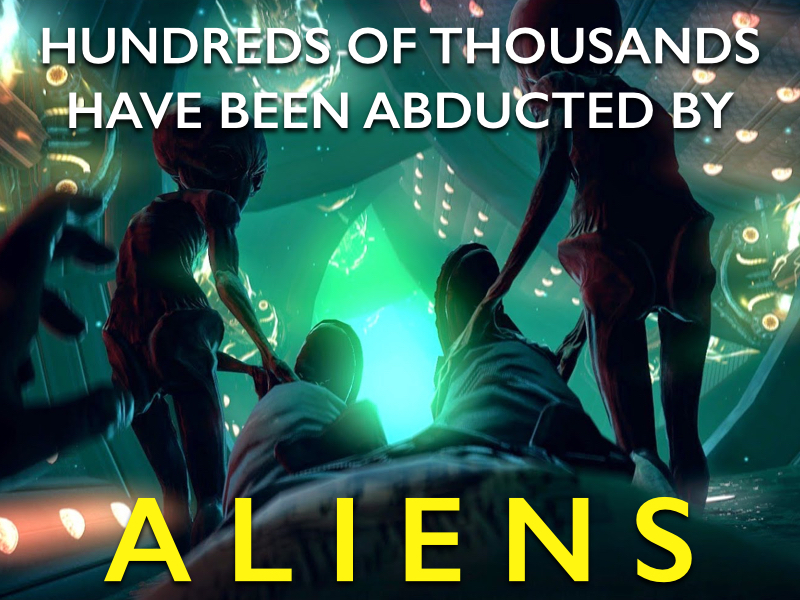 I don’t want to alarm anyone, but did you know that there have been hundreds of thousands of people who have claimed, being a victim of a UFO alien abduction at least once in their lifetime, most without them even being aware of it. Imagine that? Over hundreds of thousands of people, including many movie stars, (Shirley MacLaine comes to mind), tons of army personnel and some political leaders, people from all walks of life. They did a study on it! At Wyoming State. A professor named R. Leo Sprinkle. He says, there are certain characteristics and sensations people have in common after being abducted. Have you ever missed a few minutes? Maybe an hour? How about a day?Where you just can’t remember, if your life depended on it, where the time went. How about a feeling or sensing something happened but you just can’t put your finger on it? It’s happened to me, not just once and seems to be happening on a more frequent basis lately. I’ve dreamed of flying saucers, hell, I’ve dreamed I actually flew. I’ve dreamed of weird places and ugly creatures from far off worlds. Name your nightmare and I’ve dreamt it. I’ve even had flashbacks of all the above. I’ve had urges to take off, I mean go on a trip, not that kind of trip, a vacation. Is that odd? And, I’ve always had an interest in UFOs, maybe not suddenly but more like in spurts including ancient history, magic and wicca, almost everything odd, strange or peculiar. That’s just me. All of these symptoms, says Professor Sprinkle, are signs that you’ve been abducted by a UFO at some time in your life, but when it comes to me personally, I have other theories on alien abductions. To me, even though I’m a firm believer in UFOs, it’s more likely to stem from what I’ve been drinking or smoking the night before, which give me these strange sensations and characteristics and has nothing to do with an alien abduction, at all. I still won’t rule it out altogether, though.